We really recommend using CocoaPods, but if that's not your style, follow along here to install manually. 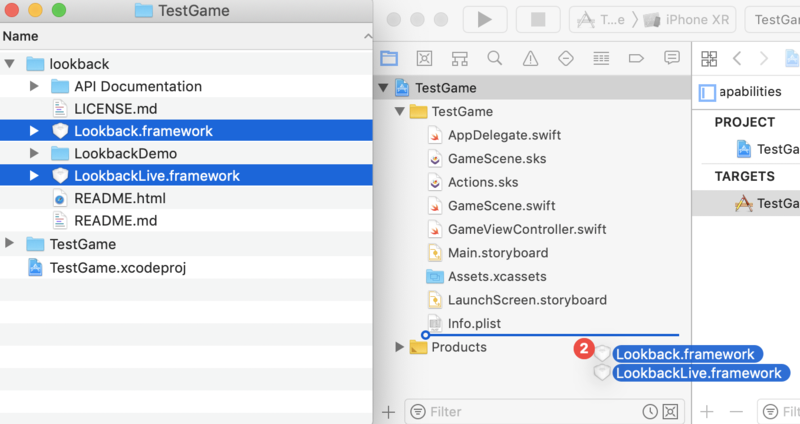 Download the Lookback SDK and unpack it into your project's folder, so that the folder lookback resides in the same folder as your Xcode project. Pull Lookback.framework into your project. If you plan to use the live streaming feature, also pull in LookbackLive.framework . In addition to Lookback.framework, also drag LookbackLive.framework into your project, choosing to not copy, to create groups, and to add to your main target. LookbackLive depends on a fork of the project WebRTC, which is distributed through CocoaPods. To find the latest version, see the CocoaPod of LookbackWebRTC, click "See Podspec", and follow the link to WebRTC.zip under source.http. The zip file will contain a WebRTC.framework — copy it into your project's folder. Drag the framework from your project folder into your project, and again, choose to link with your main target, without copying items. Lookback Live depends on the third party library SocketRocket, 0.5.1 or newer. Please follow their installation guide to get SocketRocket into your app. In the Build Phases tab, press the + button to add another Copy Files build phase. Rename it "Copy Frameworks", and set its Destination to Frameworks. Add Lookback (and LookbackLive, if you're using it) to this build phase, and make sure code signing is enabled.